See our selection of EASyL accessories! All-in-One design. Easel, palette, supplies and panel storage spaces in one single unit. Easy to set up under one minute. 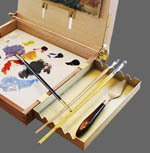 Easel and Palette are made from Beech wood. Protected with clear varnish to sustain the beauty of natural wood grain. Innovative control knobs to adjust easelback to any angle instantly. No brush stroke obstruction. All metal parts are solid brass. All screws and fasteners are stainless steel. Rust free guaranteed ! Uniquely designed brass baseplate for tripod mounting. For watercolor or pastel painting, easelback can be adjusted to horizontal position. Palette Size : 10"x12". Depth 1-1/4"
Built-in wet panel carrier for two 1/8" thick or 3/16" Gator panels sizes: 8"x10" or 9"x12" or 8"x11" or 10"x12". 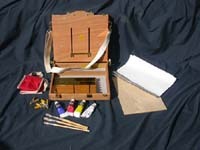 1- Collapsible easel and palette combination box. 1 - Stainless steel brush holder. 2- Solid brass hooks (for water bottle or brush washer). If you already own a sturdy tripod , you may purchase the LITE box without the tripod. LITE Box only comes with brush holder and two hooks. I keep buying pochades and easels. I've tried most of them. I even had a custom one built. After receiving my EASyL-Lite, I've stopped my search. For my purposes this is easy to use, light weight, and versatile. I have even bought them for friends because I like them so much. I have been very pleased with the EASyL-Lite. I have used it in a number of situations from the studio to rugged locations and it has performed great. The size, weight and working simplicity of this pochade box are exactly what I have been looking for. It is very compact and easy to get set up and working quickly. It is also very easy to take for both air and ground travel. 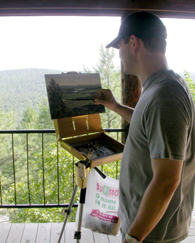 I will use it extensively on my travels to teach workshops and for personal painting trips. The artist's work is shown in the cover page of November/2003 issue of American Artist magazine so is a featured topic. The setting up of the Easyl Lite is so easy it took me awhile to get use to since for 12 years or more I have been struggling with my Julian and Yarka Russian easel. The tripod is durable and with the quick snap adjustments it takes me less than 20 seconds to get it at the desirable height. Mounting the Easyl Lite probably only takes me 15 seconds with the help of the quick release plate. Then I am ready to put down my paint and start the session. Well, I must say that my easel shopping is at a halt. In other words, the Easyl Lite is the perfect traveler/ companion for me when doing plein air work. Thanks for such a beautifully designed product. I hope more discover your Easyl Lite. It will save them much time. I am attending a painting workshop in Colorado this week. I was the only one with your pochade box and everyone there was very interested. I gave them your website address. I was also the first one set up and ready to paint - thanks! I love the carrier box and the pochade box. I have to tell you at first I thought there was something defective about the slotted insert for the 8x10 canvas boards. I couldn't get them in at first. Then I finally noticed the tiny notch to snap the piece in place and VOILA! What a cleverly designed and beautifully crafted piece of equipment. I truly love it! Just a quick thank you for the great tripod! I should have bought it from the beginning. Plus, I already love the pochade box, it is so sturdy and easy to use. I am in a big plein air show in August. I can't wait to show the other artists and spectators your products. 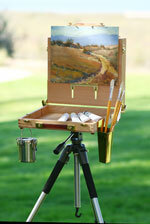 EASyL-lite is a trademark of the plein air easel by Artwork Essentials, Inc.